In recent weeks I have shared typical older masks from the Tlacaloleros dance; I imagine that they date to the 1960s or 70s. Today I will introduce other Tlacololero masks that are more unusual in their designs or styles, although they may have been commonly used in the past. I will present these treasured examples in small groups, to savor them. In my experience, masks like the first two are said to be “Rastreros” (trackers). These two have faces that are painted red and black. The third, which would have been worn by some other dance character, has a vivid red face. I purchased the first of these Rastreros from Spencer Throckmorton of New York City in 1995. The hair is attached to the face with some kind of glue. Last week I introduced Tlaololero masks that are typical of this dance, and this week I will show a few more of those. On page 243 of his book—Mexican Masks—Donald Cordy included a typical Tlacololero mask that had been collected in Ayutla, Guerrero. It was 29 cm. tall (about 11 inches). On page 103 of that book Cordry shared a photo that was taken in 1972 of Ruperto Abrahán, a maskmaker in Tixtla, with two Tlacololero masks in this style that he had carved, and on page 101 there is a photo of carver Cruz Teodoro (Guerrero, 1931) with another of these. In the Agenda 1998 datebook that was published by Estela Ogazón we find a stained rather than painted example from Chichihualco that measured just over 13 inches in height. On the other hand, on page 173 Cordry also included photos of six Tlacololero masks from Almolonga, Guerrero that he described as more finely carved and in his opinion older. 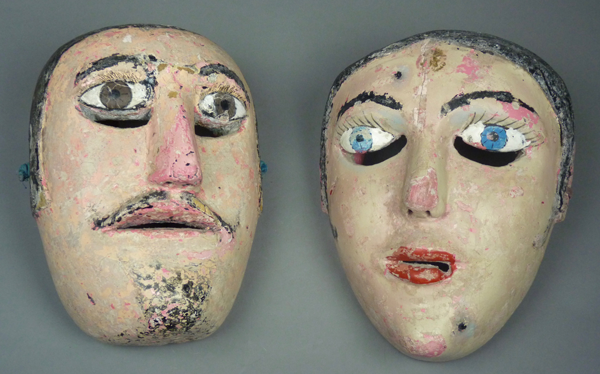 These masks are remarkable in appearance because their faces are divided into zones that are painted in contrasting colors. Also they are larger than expected—about 14 or 15 inches tall. Jaled Muyaes told me that he regarded those masks as decorative and inauthentic (see posts of August 2014—https://mexicandancemasks.com/?m=201408). Here is a mask in this style that I purchased from Jaled Muyaes and Estela Ogazón in 2001. Like most of the masks in today’s post, this one came with little provenance, just the name of the dance and the state of Guerrero. However the style of painting, with the three red lines over the nose and flanking the eyes, suggests that this is a mask from Tixtla, and probably from one of the Abrahán family of carvers. This one is 12 inches tall. 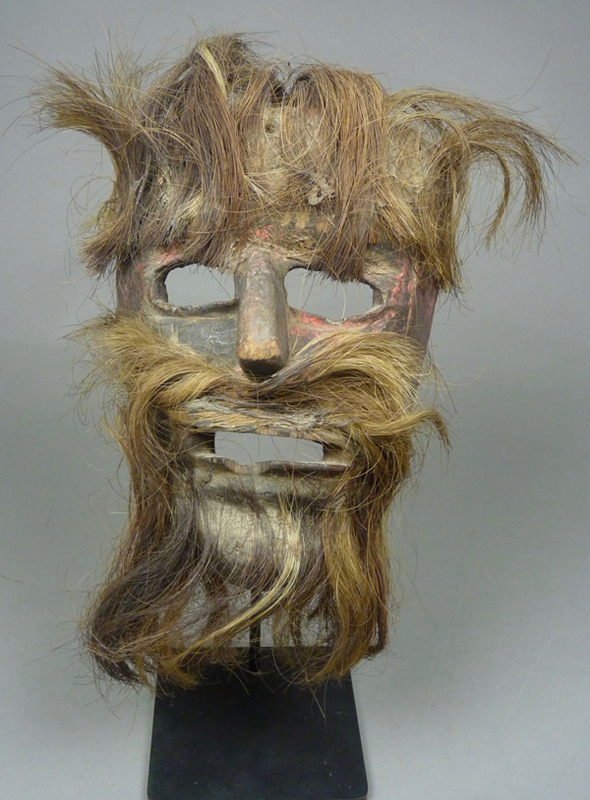 This mask was carefully carved but with a simple design. In the Mexican state of Guerrero, there is a dance drama—los Tlacololeros—in which a group of farmers hunt a dangerous jaguar. Such dances are apparently ancient. We find an area of jaguar hunting performances along the Costa Chica, the “little coast” where Guerrero and Oaxaca meet the Pacific ocean, and extending to Chiapas and Guatemala. These dances occur in a series of contiguous Native American cultures, such as the Nahua, the Amuzgos, the Mixtecs, and a variety of Mayan cultures. The Tlacololeros dance survives in an area known as the Tlapaneca, which was traditionally occupied by the Tlapanec Indians. According to Danzas y bailes traditionales del estado de Guerrero (Mexico, 2005, pages 66-84), this dance presently persists in the following towns—Chilpancingo, Chichihuaco, Tixtla, Apango, Mochitlán, Zumpango, Tecoanapa, Ayutla, Zitlala, Chilapa, and others. You may already be aware of the considerable variation in mask styles between these many towns, and Tlacalolero masks, large and small, will illustrate this. Over the next few weeks I will show you some real beauties. Some nearby towns dance the Tecuanes dance instead; there is considerable overlap in terms of mask designs. In this next video, from Chichihualco, all of the masks are black. I include this one to share the accompanying text, which is interesting in its explanation that this dance appears to be a surviving form of an ancient supplication for rain. 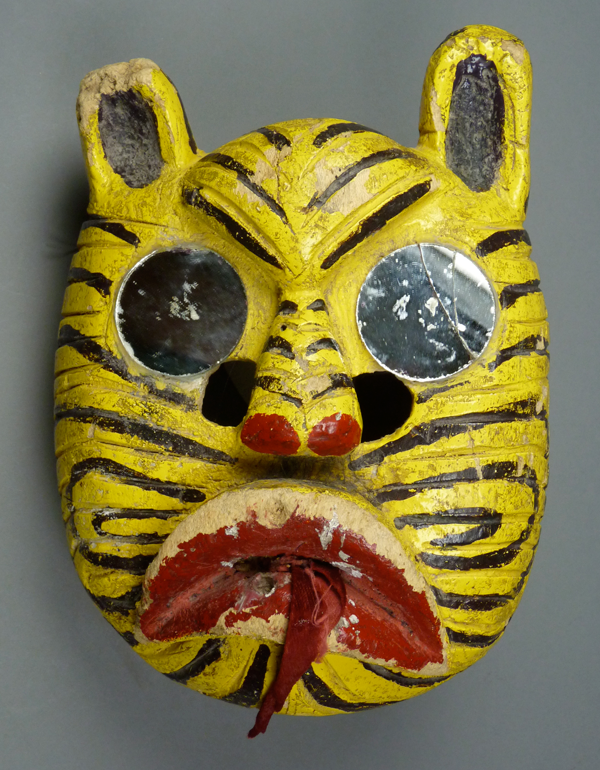 Now here are some Tigre masks from these towns to get us started. I originally showed you these in October, 2014. The Tlacololeros pretend to hunt such jaguars. The first, carved from wood, is in the style of Tixtla. In recent weeks I presented Feo masks from Paso Ancho, Michoacán whose wearers spar with bulls. Then I introduced you to what is probably a similar dance in Charo, Michoacán. The Torito dances of Guanajuato are perhaps the most dramatic example of this genre of dances in which a bull interacts with provocatively behaving actors (Feos). 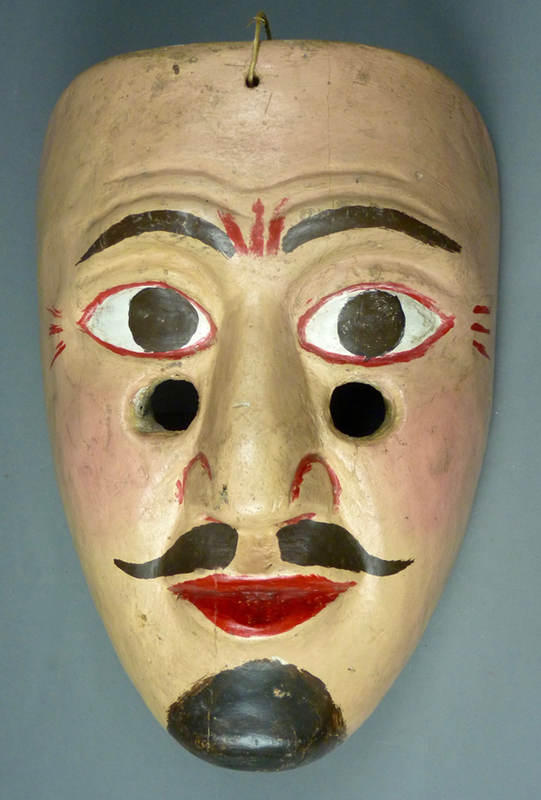 In today’s post I will show some older masks from this Guanajuato version, even including a body mask worn by the Torito dancer. Here is a Youtube ™ video of the Torito dance in San Juan de los Lagos that was performed by a dance group from Silao, Michoacán. This is a balanced performance, featuring excellent music combined with highly coordinated dancing. It is a pleasure to watch. One of the characters in the dance is the wife of the Hacendado (the hacienda owner). She can be called Maringuía or La Bonita. In this instance (in the Silao video), she is apparently the relatively dignified female wearing a long white skirt. I have in my collection an older Maringuía mask that I purchased, along with a Hacendado mask, from Robin and Barbara Cleaver in 1989. This pair had originally been collected by Jaled Muyaes and Estela Ogazón in the 1960s or 70s. Here they are—El Hacendado and La Bonita from the Romita/Silao area of Guanajuato. Later I will show them in greater detail.